What Are The Different Types Of Climbing? Asking someone “Do you climb?” doesn’t always have a simple yes or no answer. There are different types of climbing and some purists may turn their noses up at certain types of climbing to the point that they won’t recognise it as “climbing”. But, we live in an ever changing world where people are constantly redefining the way we climb and pushing the limits of what’s possible. The courage and strength of some individuals is so mind blowing that scientists do studies on them. Like Mr Alex Honnold, who can be matched in strength but not in the ability to overcome fear. So with these achievements in mind, we can’t afford to stay narrow minded! 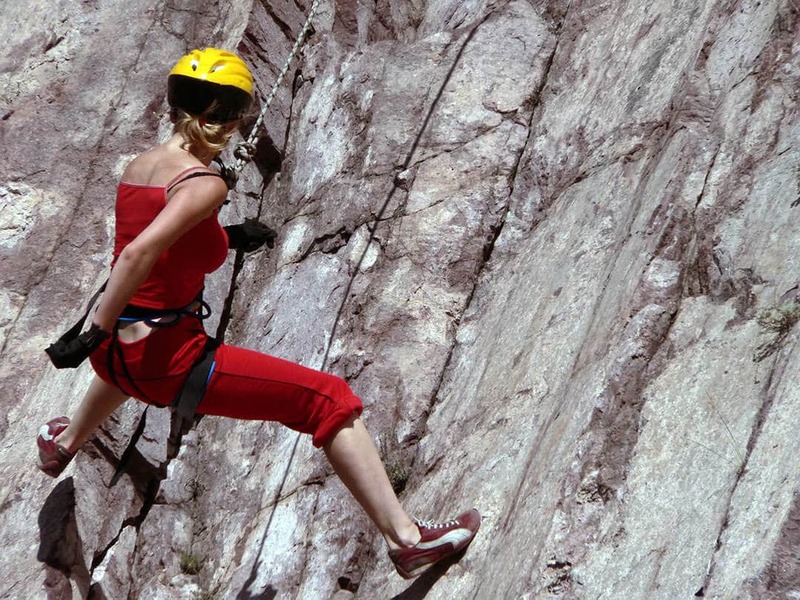 Let’s take a look at what the types of climbing are. Now these are the top of the pile types of climbing, under these titles, lots of little sub titles fall. Things like lead climbing in sport climbing or traversing (which is going sideways not up) or roof section (upside down). These are types of techniques in climbing so let’s not get too confused. I’ll make another article for you for that. This is considered to be one of the safest types of rock climbing. A top rope climb means you, as the climber, are attached to the rope at one end and your belayer at the other. The rope runs up the wall, through some anchors at the top and back down to your belayer. As you climb, your belayer takes rope through, so, if you are to fall, the distance is minimal. In some cases, hardly even noticeable! This is the typical setup you’ll find in indoor gyms. Other circumstances is where there isn’t the choice to place gear up to wall to lead the climb first. For example, if the rock is soft and prone to erosion, it’s not safe to place gear to fall on as you lead the climb. So climbers will gain access to the top and make anchors from there instead. Obviously, this is only an option for climbs that are reasonably accessible from the top. Once someone has lead a climb, come back down and cleaned the route (unclipped their quickdraws from the bolts) on the way down, then it’s called a top-rope climb. This is how many outdoor courses are run. The pre-mentioned “lead climbing” falls under sport climbing. Sport climbing means there are fixed anchors in the rock throughout the climb. These anchors vary in appearance. You can have just the bolts which then you need the bolt plates, you can have the bolt and plate fixed or U-shaped rings. As the climber you are on one end of the rope, your belayer on the end of the other. As you climb you fix yourself into the anchors. This is because unlike top-rope you don’t have an anchor above you with the rope fed through to catch you. So when you fall, you fall to below your last anchored point. This is what makes sport scary…and fun! (Depending on who you are). When you reach the top, you hook yourself into the anchors, untie yourself from the rope, feed your rope through the anchors, tie yourself back in and then your belayer brings you down. Depending on the climb and climber, some people unclip their quickdraws they used to anchor in on the way up, as they come down the wall. Sport climbing can be more of a mental test than physical. Knowing you are about to take a whopper (a big fall) gets that adrenaline going! It’s imperative to learn how to control your fear while you are climbing. Personally I believe, the overcoming of fear is the most satisfying part of a climb. Whereas, trad again is another level of confidence as you must place the anchors yourself as you climb. More on that below! Trad climbing is the most gear heavy type of climbing. Trad climbers can look as if they are wearing a tutu of metal. A Trad climb means the climber must place all the gear as they climb to create the same anchors in sport climbing. There are no bolts for a climber to hang a quickdraw off! They use a series of devices in all different sizes. These devices are called cams, nuts and hexes. The smaller ones are just named mini “whatevers”. Climbers use these to place in cracks up the walls face and attach their quickdraws then rope through the other end. Once a trad climber reaches the top sometimes they will find an anchor but most of the time you have to also make an anchor from your trad gear or perhaps a tree/big rock. If having to place your gear you’ll fall on isn’t scary enough, you’ll find most trad climbs are much further spread out. What that means is that places to anchor your gear into are further apart, making your falls further apart! Better get good at falling! For the adrenaline junkie. Or those who don’t get scared. Or at least handle their fear extremely well. People like Alex Honnold who has become famous over the last 5-10 years for his free soloing of big walls like El Capitan in Yosemite. Of which, he is the only one to have ever done so! The difference between free solo and soloing? Soloing is done solo but with a rope. Free soloing you have no safety gear at all, just you, your shoes and a whole lot of balls. Soloing with a rope requires the climber to have a self belaying device or system, it’s nowhere near as safe as being belayed but it’s exponentially safer than free soloing. Deep soloing is climbing done on rock overhanging water. This way if you fall, you hit the water. Some climbs, especially around Asia on their limestone karsts, you have to jump off! That’s the real blast, if you are like me and have issues jumping off things, then it’s a double whammy. You want to keep climbing because it’s fun but then you also have no choice but to jump from wherever you climb to. We sat there singing “I believe you can fly” to one girl who got too scared to jump, it helped…I think. Bouldering is the new and upcoming way of climbing. Many younger kids are getting obsessed with bouldering. It makes sense, it’s cheaper (no gear except shoes and chalk) and you don’t need to always rely on someone else. It is best to practice safety and always climb with someone even if it’s bouldering though! Bouldering is climbing done on short climbs, such as boulders or rock faces. Indoors is also extremely popular for bouldering. The climbs generally are difficult and technical, so it’s more about building skill and strength than endurance. Crash mats are used at the base of the climb to fall on and spotters are advised. Many people will boulder in gyms alone but outdoors where the ground isn’t flat and other people aren’t around, you should always go with someone. Bouldering partners are your spotters. You as the climber can sometimes fall an awkward way and your spotter is there to make sure your head / any bones stay in one piece. It’s just as important to learn how to spot someone correctly as it is to learn any techniques for the actual climbing. Of course someone is always taking it to the extreme and there are these nutters than do what we call “high-ball bouldering”. It’s basically bouldering but on something quite high, but not so high you’d call it a “climb”. It also normally means the boulder is boulderish in shape as opposed to a small wall. The actual distance that measures the difference between a boulder, high ball or just free soloing is entirely dependent on the climber who’s judging it. To most climbers and myself, we agree on anything above 4m is high-balling and above 7m or 8m is becoming a free solo climb on a boulder. Yes, that is confusing, we know! Now all climbing requires different types of gear of course. If any of these types of climbing have got hustlin’ and bustlin’ in your seat to give it a go, you should consider purchasing the necessary gear! We have a great article of gear tips for beginners but you won’t find things like trad gear and ropes in there. If you are looking to get into trad Black Diamond does a great deal on a set of cams here and DMM have a set of nuts that are also great value. Plenty of people are doing ropes out there but you need to be careful. You can’t just grab the rope you made a rope swing with 10 years ago. Stick to the big brand names and make sure it’s sold as “climbing rope”. Best yet, go into a store and talk with someone, look at what you want, then scour the internet for a good price. Black Diamond have this dynamic rope for a very reasonable price. Dynamic rope stretches which aids your fall, buying a static rope is not idea for climbing. Can’t wait to hear all about your climbing adventures!! If any of you find Alex Honnold along your travels, kindly ask him to marry me please. Thanks! Heya! I'm Sarah or many call me Sacky! Some years ago a solo 3 month trip through Asia changed me forever. It stirred the adventurer in me and gave me the confidence to try new things. The desire to accomplish these new tasks became addictive and thus a slight attention deficit approach to participating in outdoor sports was born. A problem arose when I realised that my lifestyle couldn't incorporate the normal 9-5 so I became a freelance writer! So here I am somewhere between random library desks, mountains and the surf soaking up this opportunity!